After watching this movie last week, I feel like I have the need to educate the public about this movie. It is a horrible! I mean I would know it’s horrible just by looking at it. What actually made me allow myself to waste my time watching this movie is because I’ve saw a documentary on how the directors and graphics effects team try so hard to make everything look as realistic as possible. How Ghost Rider pisses fire and how the leather jacket boils up close. I was suckered into the beautiful effects. Was it worth it? Nope! 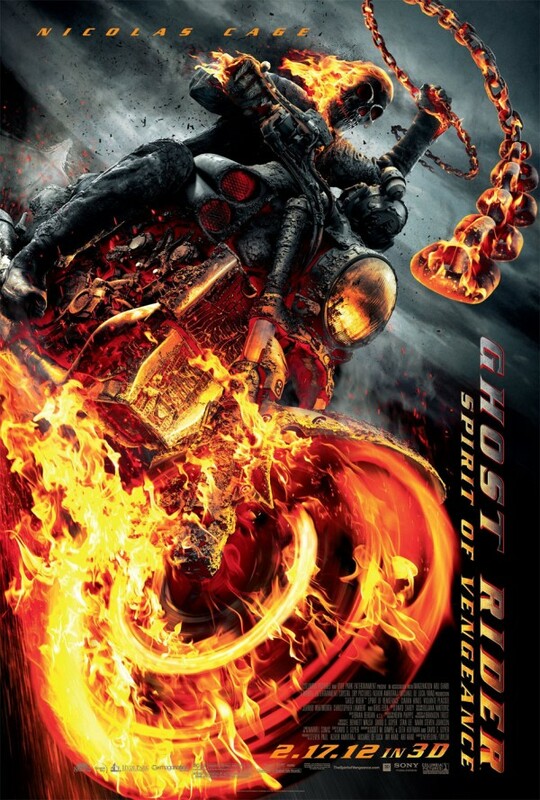 If you’re a movie goer, you would know that back in 2007 was the first installment of Ghost Rider. But that wasn’t such a great film. How about the second installment? This time around, Ghost Rider is on a quest in return to save his own soul, the very one he sold long ago to save his father and in return do Satan’s deeds. The story starts off with a special kid everyone was looking after. As usual, it doesn’t take a rocket scientist to figure out that this special kid has of some use to the Satan. Ghost Rider was brought into the picture of this kid by this holy person who happens to be on a bike as well. This holy personThe attractive contract offered was that he gets to redeem his soul and be once again the human himself, Johnny Blaze. Tempted by the offer, he allowed Ghost Rider to manifest and went on a hunt for this kid. The search for the kid was an easy one and quite a thrilling one. After uniting with the kid, there’s quite a chunk of sentimental drama scenes though. Johnny Blaze did deliver his end and he was cleansed as promised. Don’t worry, the story doesn’t end here. It just gets weird. Ghost Rider is gone and the kid is once again captured on holy grounds. And so, being the superhero without powers he proceed to try and save this kid again. Déjà vu? This is as far as the spoiler free goes. If you want to read about what happens further, do scroll down way after the trailer. Ghost rider: Spirit of Vengeance 2012 is a high-octane style comic movie. Directors Brian Taylor and Mark Neveldine took great lengths to film this movie. Neveldine actually went on rollerblades and lugged a giant, expensive 3-D camera to film flying off cliff shots. But how many of us really care if it’s shot on Red or an iPhone? We walked into a cinema every time hoping that the trailer we saw months ago is not a lie. We want to watch something awesome! This film is made for mindless comical carnage with tons of fire effect. The whole film is pretty dark and grunge drooling with grit. I’m quite disappointed that Ghost Rider did not ride as much as the first film. The comic book Ghost Rider is all about riding the bike and conjuring a hellfire bike out of thin air. Chains and fire and more chains flying around from his throat or chest that incinerates every object that stands in his way. Also, they have totally removed the penance stare that literally kills anyone and the ability to defy gravity with his awesome chopper. The villains are nothing awesome to shout about. After all, you do know that Ghost Rider is considered one of the most powerful Superhero. Ghost Rider is virtually unstoppable like Hulk. The only way to contain their carnage power is their human form. Acting on Nicolas Cage’s part is okay. The lady and the kid are annoying. All others are just fillers. I believe I didn’t enjoy any of the acting bit at all! Wasn’t sure if it’s intentional or just bad sound editing that most of the people are talking in odd accents and sounded mumbled. They did try to put some comedic elements I honestly think it wasn’t really that funny. Finally, I do wanna give some credits to the special graphics team and the director for the comical adaption of the onscreen play. If only your story line was amazing (read on further below after the trailer to find out why I hated the story line), you would’ve had my full support in Ghost Rider 3. The ending bit where Ghost Rider sent Satan himself back down to hell! So Johnny Blaze went to save the kid with no powers and lots of ammo. He was daring enough to wrestle Satan himself. But of course he was flung way down the stage and found himself in a near death situation. At this point, the kid who has got the powers of Satan himself, gave Johnny Blaze his powers back. The same contract that he signed years ago. Ghost Rider reemerges, bad guys are all gone but kid dies. Fret not though, only in comics you get to lose your powers and get em’ back. So the kid was revived by Ghost Rider. End. As if losing your powers and getting it back is not enough. They had to kill the kid and bring him back to life. I hate movies like this. It’s just too cliche.